Tomorrow is the day to celebrate Women across the country and since it’s a public holiday why not spoil yourself with a movie? A great romcom or chick flick with your girls sounds like the perfect plan right? 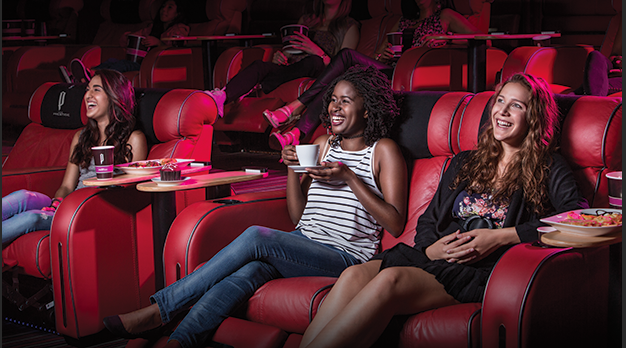 The Ster Kinekor Cin Prestige offers the ultimate VIP treatment. Audiences get to relax in large leather chairs that unfold into a comfortable reclining position to watch the latest blockbusters play out on the big screen. All this, while you indulge yourself in one of the many gourmet platter options available, delicious coffee and cake, and, of course, the mandatory soft drink and freshly-popped popcorn! We all hate standing in long queues when all you want is to sit back, relax and watch a great movie. The Cine Prestige gives you the privilege to place your order, and the friendly waiters will bring it to your seat during the movie. This also means that queuing for tickets and catering is now a thing of the past.